Comma markers, round-off and decimal selectors allow you to work with large numbers. 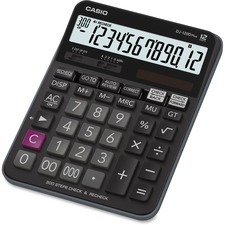 Dual 12-digit LCD displays permit multiple calculations; use the second screen to hold an answer from a previous calculation. Comma markers, round-off and decimal selectors allow you to work with large numbers. Ideal for business with Profit (Cost/Sell/Margin), Tax, Currency Exchanges and more. Power Source(s): Battery; Solar; Display Notation: Numeric; Number of Display Digits: 12; Display Characters x Display Lines: 12 x 2.